Bulletproof glass, fire extinguishing system, fresh-air system and wheels with steel with synthetic run-flat rings. If this sounds like something you need then you’re in luck. Audi announced it will be producing a high-security version of the their largest and most specious sedan, the A8 L. The A8 L Security is the epitome of over-the-top protection for those individuals who need added piece-of-mind when traveling from place to place. The A8 L Security’s list of defensive technology as long as the Great Wall of China and includes all aspects and sections of the vehicle, from the suspension, body structure, drivetrain and interior. The A8 L Security is powered by a W12. The 6.3-liter, 12-cylinder pushes out 500 horsepower and 460 lb-ft of torque. In addition to the W12, Audi says it will unveil a second engine for the A8 L Security. Audi has stated this second engine will be very fuel efficient. Audi has estimated it will average between 21-23 mpg. The body structure and interior cabin is reinforced and armored to protect the occupants inside. The vehicle utilizes many high-tech and advanced materials including: hot-formed armored steel, aramide fabric, ceramics, special alloyed aluminum and multilayer glass. The joints and seams features overlapping armor to prevent any projectiles from entering the cabin. The interior also has added communication systems that would allow the passengers to stay in contact even in the event of a attack. The nerve center of all this communication is located in the “communication box,” which is heavily armored and is located in the luggage compartment. Some of the most outrageous options on the A8 L Security is the fire extinguishing system, emergency fresh-air system and smoke extractor. The fire extinguishing system is operated by heat sensors or via a button. Upon activation, the fire extinguishing system sprays a fire retarding agent into wheel arches, underfloor of the passenger cabin, the area surrounding the gas tank and the engine compartment. The smoke extractor removes contaminated air from the cabin, while the emergency air-system allows the driver and passengers to breathe safely while exiting the danger zone. The Audi A8 L Security is a true purpose-driven vehicle. If a head of state, Italian mob boss or controversial figure needs to get from point A to point B safely, not to mention in style, the A8 L Security will probably fit the bill. 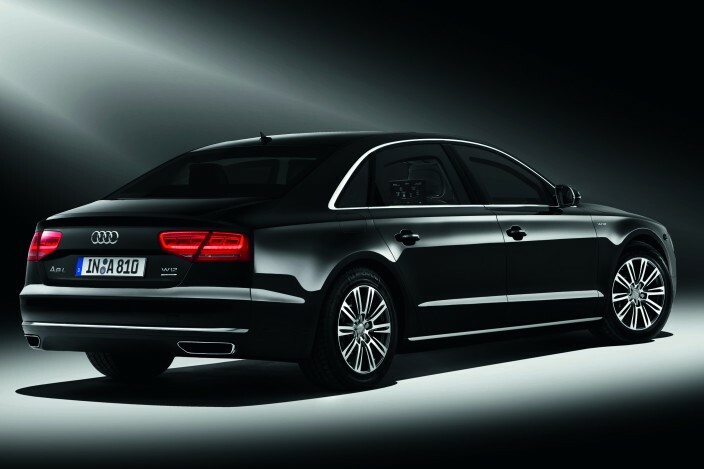 The A8 L Security will go on sale in late summer 2011.